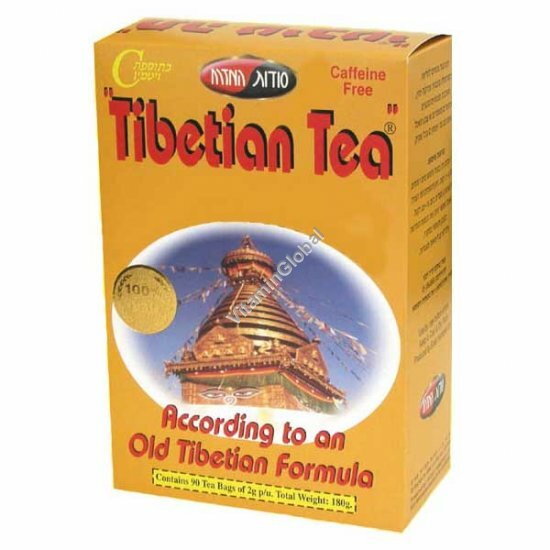 It has been known for centuries that Tibetan tea has a number of medicinal properties that make it ideal for those who are dieting, as well as those who are suffering from constipation. For dieters, Sodot HaMizrach's special formula in their Tibetian Tea brand provides for strengthening of the immune system. For constipation sufferers, drinking Tibetan tea acts as a natural laxative which is quite effective. Directions: Pour boiled water in a cup and steep 1 tea bag for 3-5 minutes. You may use sugar or any other sweetener. It is recommended to drink 3 cups a day: 1 cup 15-20 minutes after each meal. Ingredients: Laurus Nobilis, Tilia Europea, Cymbopogon Citratus, Urtica, Mentha Spicata Leaves, Rosa Canina Fructus, Camelia Sinensis V, Gunpowder Leaves, Matricaria Chamomilla, Echinacea Angustifolia Radix, Terminalia Chebula Fructus, Terminalia Belerica Fructus, Vitamin C.
Contents: 90 bags, 2g per bag (= 180g). Kashrut supervision: Badatz Beit Yosef, Rabbanut Holon.